Open 10.00 to 18.00 Saturday to Thursday and 10.00 to 22.00 Fridays. The best time to visit is daily from 10.00 to 15.00 or on Friday Evenings when the museum is less crowded. We are comparing Stedelijk Museum Ticket Skip-the-line Prices from leading ticket suppliers and Try to find you Cheap tickets prices on the market. This is one of Europe's best collections of modern art hosted in a glorious contemporary building in the heart of Amsterdam. During the holidays and summer season this popular attraction can take a while to get into but fortunately this pre-booked ticket will let you skip the entrance lines at your reserved time. This recently renovated building contains the Netherlands greatest collection of 19th and 20th-century artworks, with exhibitions of some of the major modern art movements like pop, conceptual and minimal art, Bauhaus, abstract expressionism, De Stijl and The Amsterdam School. 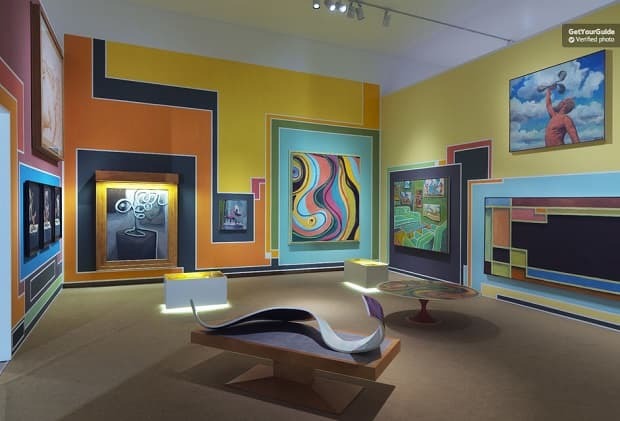 Here you can find the works famous Dutch and international artist such as Jackson Pollock, Andy Warhol, Koons Malevich, Picasso, Sottsass, Kienholz, Appel, Kandinsky, Dumad, Cezanne and plenty more. Art and history enthusiasts can easily pass an entire day drifting between the works of Koons, Chagall, Matisse and so on. While others might just stay an hour or two. With the aid of an audio guide (optional) you will be able to discover The Stedelijk Museum, it's thought-provoking paintings, 3D exhibits and interactive artworks, at your own speed. This tour is aimed at visitors who are interested in art, specifically modern and contempered works. There are a number of interactive exhibitions so a visit to the museum may also appeal to children. The fast track entrance is very convenient for visitors with a short time in the city. Your Experience With Stedelijk Museum Ticket Skip-the-line ? Skip the line to Amsterdam's greatest collection of modern and contemporary art hosted by The Stedelijk Museum. Browse the spectacular newly renovated building which houses a total of 90,000 articles. Browse a renowned collection of modern and contemporary artworks. Explore the museum at your own pace on a flexible self-guided tour. Don't Waste time waiting in line, with this ticket you can go directly to the museum entrance via the fast-track lane. What Stedelijk Museum Ticket Skip-the-line Includes? Skip the line entrance ticket to the Stedelijk Museum. Travelers Reviews about Stedelijk Museum Ticket Skip-the-line ? The skip the line entry ticket has 5-star feedback on Viator. On Get Your Guide the ticket has over 200 customer reviews and high rating of 4.5 out of 5-stars. This entry ticket is quite new and has not been rated on TripAdvisor yet. Comments agree that the museum has a good variety of artworks on display therefore there is something to keep all members of the family entertained. Negative reviews for this attraction have come from customers who had limited access to exhibitions due to renovation works. Tickets are accepted in paper of electronic form at the museum entrance. Some ticket providers allow cancellation up to 24 hours in advance, others are non-refundable. An audio guide is not included in the ticket price but can be purchased on entrance. Audio guides are available in 6 languages; English, Dutch, German, French, Spanish and Italian. Museum Entrance: Museumplein 6, 1071 DJ Amsterdam.